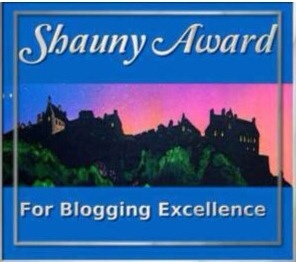 On January 21, 2014, I was nominated for the The Shauny Award by Suzi of the blog, Tales of a Slightly Stressed Mother and again, February 26, 2014 by Mark of the blog, markbialczak.com. Thank you to both Suzi of Tales of a Slightly Stress Mother and to Mark with markbialczak.com! If you have not already found these two wonderful blogs, I urge you to click on the links above and check them out. They both write about a 'little of everything' and in a very interesting and inspirational way. I have enjoyed following both of them, reading their terrific posts, and interacting with them them through comments. This is the first year that I am accepting awards. Last year I was too new and was busy trying to figure out how to blog on WordPress. When Suzi nominated me for the Shauny Award earlier this year, I was committed to the ZerotoHero Challenge and needed to postpone the acceptance of it. The Shauny Award was started by Dr. Rex in tribute for Shauny Gibson, a young man who contributed a great deal through his efforts on WordPress. 6. Share the award by nominating ten other bloggers. These are the ten bloggers that I have enjoyed following and reading their posts. I am nominating them because I feel each of their blogs have these six qualities and deserve to proudly show this award. If you have not read any of their posts, I encourage you to click on the links below and check them out. To those who I am nominating, if you do not accept awards, I ask that you forward this nomination post to a blogger who you follow that you personally believe deserves to be presented with this award and allow them to take your place. Thank you to each of you for writing such wonderful and inspiring posts! ← 2:00 am Wake Up Emergency? Very very cool. Congratulations on this! Well deserved! Great post P.J. Glad you were able to accept it. Going to look at the blogs you nominated. Good morning Suzi! (It’s 7:00 am here). I decided to accept them this year. In fact, I started to go back and try and accept the ones from last year as well, and then decided I would just start from this year. Hope all is well your way. Looks like its going to be raining here today. Oops sorry. It’s 2.30 pm here. We’re all ok. Raining here too. You’re welcome! And you deserve it!! I actually did include you! I am sorry about the misspelling, I will go change that right now! But YES, you were nominated for the Shauny Award. Please follow the instructions on my blog. Thanks! !